This is an example of a trip we have organised for a group with a farming background but who also want to see the beauty of the South Island. We will organise a tour to suit your requirements. 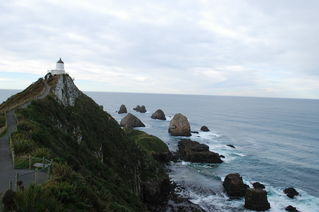 It can have some New Zealand hiking, or rafting experiences, or any other features that you choose. Feel free to contact George for any information. Arrive in Christchurch. 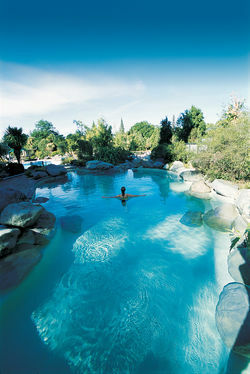 Transfer to a van and travel to Hamner Springs .In the afternoon you can rest and soak in the thermal pools. This evening we will have a drink in local bar, with time to get to know one another. We will talk about the optional activities that are available during your tour. After breakfast, we travel onto Kaikoura, where we will board a boat to view the giant sperm whales. This is said to be one of the "must-see activities" when in New Zealand. Kaikoura is also a fishing port, so it is a good chance to have a lovely seafood lunch. We travel back to Christchurch for the night. There may be a chance to see the damage done to the city in the earthquakes of 2010/11. Following breakfast, we begin our trip to Dunedin. During the day we pass though some rich cropping land, with also some large dairy farms, and smaller sheep farms. We cross several large snow-fed rivers, some of which are well-known for salmon fishing. We visit a piggery and start learning about farming in New Zealand. During today at times we will travel next the coast, while other times we will be well inland. 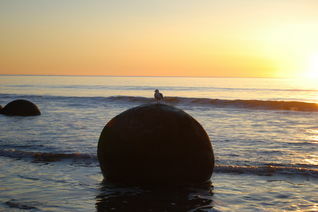 Just north of Oamaru we will stop to view the natural phenomenon of the Moeraki boulders. This morning there will be a chance to have a look around the city of Dunedin, and maybe do some shopping. The city has some lovely old buildings, and has a Scottish heritage. If time allows, or for those who want, we will drive out to see the giant albatross colony. Further south is the sheep. beef and deer farm of George and Mary Scott, your iTrek hosts. You will stay in Gore, a rural town, a short distance from the farm. Gore is well-known for its art gallery, and the moonshine whiskey which was brewed in the hills during prohibition. We will be able to sample a local menu featuring local lamb, beef or seafood, at one of Gore's restaurants. This morning George will explain the workings of a New Zealand sheep and deer farm. George has won national awards for his stock, and also for his environmental work. Maybe he will shear a sheep for you. In the afternoon we will visit another farm, either a cropping farm producing world record crops, or a dairy farm. Today we travel into Northern Southland and on to Lake Te Anau, which is on the edge of Fiordland National Park. This afternoon there is an optional trip for those who want to see the glow-worm caves. Others may want to rest or shop in Te Anau, or there is a short walk nearby on part of the Kepler Track. Deer farming in New Zealand started with the live capture of deer many from the Fiordland area. Tonight you may have the chance to have venison (deer meat) for your evening meal. We have an early morning start today, as you go on the Doubtful Sound Wilderness Cruise, with lunch included. Leaving Fiordland we travel to Queenstown, sometimes described as the "adventure capital" of the world. 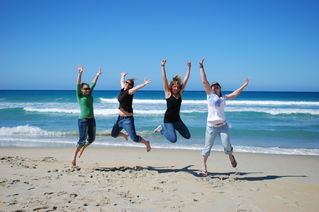 The scenery is magnificent, and there is plenty to do here from shopping, to jet-boating, to bungy jumping. You may wish to visit the kiwi park to see this famous New Zealand icon. This day is a free day in Queenstown. Remember as there is a lot to do, and it is a tourist town, we may need to book some trips or activities. You can also just relax, enjoy the mountain views in Queenstown, and do some shopping for gifts for those at home. 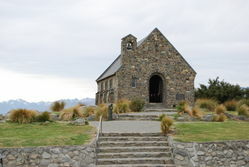 Today we travel across to beautiful Lake Wanaka, where George and Mary have their bed and breakfast accommodation. On the way will travel through some great wine growing areas. Central Otago is well known for its Pinot Noir grape variety. We will have lunch at a vineyard before arriving at Wanaka. Tonight George and Mary will host you for a barbeque meal of New Zealand lamb or venison with local wine, perhaps from a vineyard you visited today, followed by a traditional New Zealand dessert. 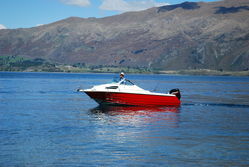 If the weather is fine, there is the option of boating on the lake. Today we drive up though the centre of the island though the Mackenzie Country. Once a dry barren area, but now with irrigation, it is good for farming. The night skies are very clear here, and if it’s a good night you can take a star gazing trip. There is also the option to take a boat trip on a glacial lake. You need to discuss these options with George at the beginning of the trip. We will have booked our evening meal for tonight at the Hermitage where we are staying, as it is the busy tourist season, and there are limited options. Some of the options I mentioned for yesterday will be available for this morning, before we leave for Christchurch. Time to pack, ready for the trip home. Tonight we will go out for our last meal together. Today you leave for Christchurch airport, and begin your trip home, with many happy memories of your genuine Kiwi experience.